The iPhone game Silent Hill: The Escape [iTunes link] has been available in the U.K. for the past week or so but it is now in the U.S. App Store. The game seems to be a little more open-ended than Brothers In Arms: Hour Of Heroes and a LOT better than Cube. Even though it is competitvely priced at $7.99, it worries me that the game is very short. 16.4 MB for a 3D first-person shooter doesn't sound promising. The rumor of an iPhone Nano has been around almost as long as the iPhone itself! On Gizmodo, I found an article just half a month after the first iPhone was released about the possibility of an iPhone Nano. Presumably, an iPhone Nano (not unlike its iPod cousin) would be a stripped down version of the iPhone 3G: smaller device, less memory and less features. iPhone case maker Vaja recently posted an iPhone Nano category on its website. It has since been taken down. A fake iPhone Nano is spotted in Thailand. More fake iPhone Nano pictures hit Gizmodo. iPhone case maker, XSKN, reveals pictures for an iPhone Nano case and even offers to sell them to anyone who wants one. In my mind, none of these pictures or website additions is slam dunk evidence that an iPhone Nano is really in the works. Just fodder to talk about waiting for the next major iPhone software update. Where's The Cheapest iPhone 3G? 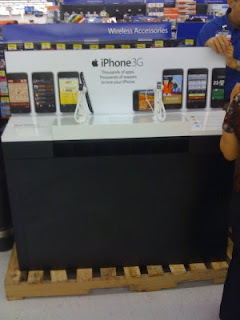 Although Wal-Mart is now selling the iPhone 3G for about $2 less than either the Apple Store or AT&T, it is still not the cheapest place to buy a brand new iPhone. According to iPhone Hacks, Best Buy is now offering the iPhone 3G for either $189 (8GB) or $289 (16GB). Still, the absolute cheapest place to buy a retail iPhone 3G is at AT&T. It is now selling refurbished iPhone 3Gs for $99 (8GB) or $199 (16GB). However, these are used and may have minor scratches and abrasions. From what I have heard though, the refurbished iPhones are very good. UPDATE 1: The Boy Genius Report says AT&T is offering refurbished iPhone 3Gs for $49 (8GB) and $149 (16GB) until tomorrow (12/31)! UPDATE 2: BGR says its source corrected the story - refurbs going for $99 and $199 as originally stated. 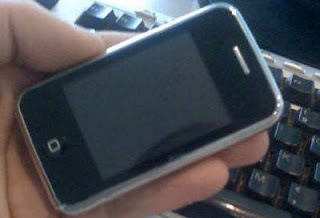 The articles I read about the iPhone 3G debuting at Wal-Mart said that it was being sold starting Sunday [yesterday]. When I went to the store at around 9:30 a.m. HST, the display was still wrapped in its cardboard. 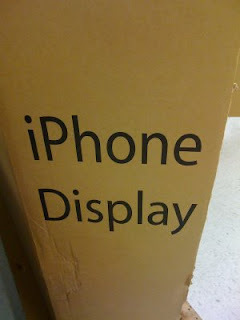 One of the employees came to take the cardboard off the display, which is when I snapped the picture on the right. Most likely by the time this is published, the iPhone 3G should be out on display. But it was interesting to see that the kiosk had not yet been set up. So, that's what you're looking for when you go to Wal-Mart. To view the video in high quality, click on the video while it is playing to go to YouTube. After-Christmas Oahu Blackout 2008 from Clayton Wakida on Vimeo. 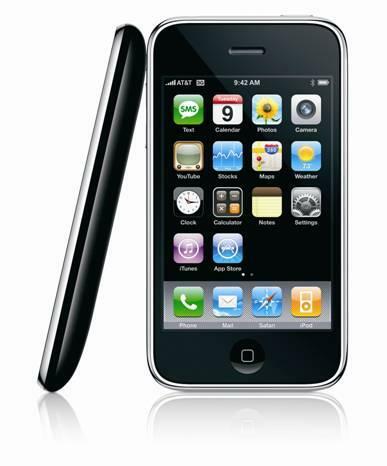 Wal-Mart announced today it will be selling the iPhone 3G starting this Sunday [December 28] at nearly 2,500 stores. However, it will not be priced at the rumored $99 price. Instead, it Wal-Mart will have prices similar to Best Buy: $197 for the 8GB model and $297 for the 16GB iPhone. I believe throwing the net larger for the iPhone can be a good thing. The more iPhone users there are, the more people will clamor for a better product and better updates. For those who wouldn't step into an Apple Store, they can now check out the iPhone. Here's my present to you, my faithful web surfer! Honolulu City Lights from Clayton Wakida on Vimeo. Although it's called "Iron Fist Boxing" [iTunes link] it's technically a Mixed Martial Arts (MMA) game since it has some kicks. It's in the App Store for an introductory price of $2.99. Hopefully, this is a sign of more games like this to come. Apparently the Konami game "Silent Hill" is out in the European App Store but not in the United States. iGameme.com has an exclusive preview of the game's 3rd stage. It looks better than "Cube" and more versatile than "Brothers In Arms." 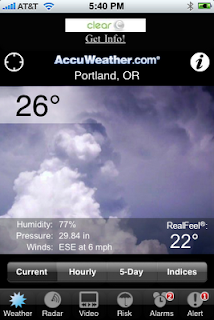 AccuWeather.com [iTunes link]- As much as I loved The Weather Channel app, AccuWeather.com is actually slightly better. AccuWeather has everything that The Weather Channel has plus a nice backdrop showing the general state of the weather, similar to the popular HTC weather app, and an animated doppler. Crystal Defenders Lite [iTunes link] - Square Enix, publisher of the popular Final Fantasy series, has made an iPhone game called "Crystal Defenders." That app is $7.99 but you can try it out for FREE with the Lite version. I was never a big fan of Final Fantasy but this game is okay for being a mobile phone game. This doesn't push the limits of the iPhone's capability but I found it somewhat entertaining. Space Deadbeef [iTunes link] - This has been one of the most downloaded free games but I thought I should mention it here. Beautiful graphics combined with an interesting touch screen interface makes this a winner as a free game. Dragon Force Light [iTunes link] - This is another vertical shoot'em up iPhone game. There's only one level but you can try out its interesting interface: your ship auto-shoots, you tilt your iPhone to move your ship left and right, and you occasionally touch the screen to fire a massive laser. The paid version is not yet out as of this writing but I assume it is coming. 1. iTunes Gift Card - The one thing that iPhone users consistently spend money on since the App Store opened in July is applications. Although many of them are free, most of them cost anywhere from $.99 to $9.99 and beyond. So, with an iTunes gift card they can get that $9.99 SimCity game they wanted or the $15.99 Beejive instant messager or the $19.99 Beatmaker drum machine. Or, they can buy songs, television shows or movies on iTunes. The iTunes gift card is VERY flexible. I have seen the iTunes gift card at Best Buy and Wal-Mart, although you can probably get one at the Apple Store. 2. Apple Store Gift Card - Many iPhone users like to get accessories. With an Apple Store gift card, they can get their own case, dock, or headphones. I would not get iPhone accessories for someone unless I knew exactly which one(s) they wanted. An Apple Gift Card will make sure they will get what they want. 3. AT&T Gift Card - AT&T bills are not cheap, so any help someone can get to pay their bill would come in handy. Also, there's a slew of iPhone accessories at the AT&T store as well. If you want to GIVE someone an iPhone 3G for Christmas, the BEST way to do that is to get the iPhone 3G Gift Card from the Apple Store. It's $199 for the 8GB iPhone 3G and $299 for the 16GB iPhone 3G. Since activation is most easily done in-store, the gift card makes it much easier to give as a gift. For a while now, it was believed that if you wanted to be a best-selling iPhone game your app needed to be under the $9.99 premium price. Most likely, you also needed to be under $7.99. After a host of games like Enigmo, Cro-Mag Rally, Super Monkey Ball and other dropped its prices as low as $.99 sales skyrocketed. Don't get me wrong, though. Most of the best-sellers are $.99. Still, people are willing to pay $9.99 for a game they think is WORTH it. And that puts the pressure on developers to make QUALITY games. There's not a whole lot of good news apps available for the iPhone. 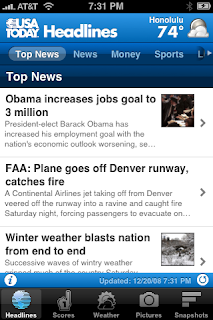 My favorite one is the AP Mobile News Network but even that app has some performance issues. News USA is also good because of the variety of news organizations it supports. However, it lacks a good aesthetic. And the NYTimes app is just unreliable. I think USA TODAY [iTunes link] is giving AP a run for its money. I love that on the "Headlines" page there is a current temperature and current conditions in the upper right hand corner. The Weather Channel does the forecasting for this app, and it even has national maps which The Weather Channel® app does not have. Although it's nice to have sports scores, that's all there is - scores. No box scores. The pictures section feels like the AP app. 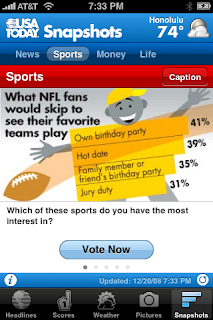 And one of the best interactive features is the section called "Snapshots" where you can vote in online polls. You can see the overall, state and city voting results. The only feature USA TODAY doesn't really have is the video support like AP. But, USA TODAY is much easier on the eyes and it may be a little more useful on a day-to-day basis. Plus, many of the USA TODAY articles are ports from the AP anyway. I'm not ready to delete the AP app just yet but I think USA TODAY could someday supplant AP as the best iPhone news app with a few more updates. 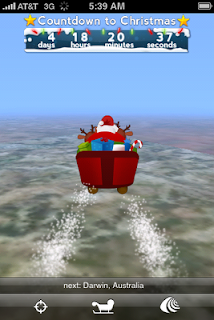 Here's a fun iPhone app that combines Christmas with photo blogging and GPS. Earthscape Santa Tracker [iTunes link] is basically a holiday version of the great Earthscape app. This one is especially designed for Christmas photos. However, to post holiday photos you will need to use Earthscape [iTunes link] to upload it. Then, make sure you choose to put it in Santa Tracker. It has a nice banner going across the top of the app telling you how much time there is until Christmas. And it has the same controls as Earthscape. 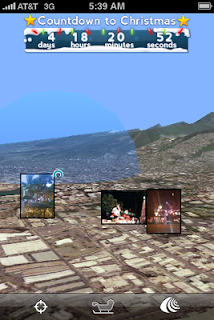 To view the landscape in 3-D, you have to do a two-ringer drag on the screen. Double taps zoom in; pinch-out zooms out; and a one-finger drag across the screen moves the map in that directon. The crosshairs at the bottom of the screen gives you your current location. Finally, the sleigh icon shows you where Santa will be on Christmas Eve according to your current time. Very cute. It's FREE in the App Store. It's EASY to do! I use iRinger to convert songs to ringtones. And I use Photoshop to resize pictures to 320 x 480 to fit the iPhone screen.